Oooooooooooooh!! That is maha adorable !!!!!!!!!!! Lovelyyy I say... i am bowled over.. Fantastic. Clever use of the hula hoop! My 1st grader is going to be a witch...but the problem is 1st graders are too cute (missing teeth and all) to be witches. Shower of compliments to Medha for the idea and to you for pulling it off! Adorable costume! I can imagine her floating down the street :D how about bubble bath for the suds? Those do last...they are very foamy. Wow very nice idea Manisha. Medha looks so happy :). aaaawwwwww that's so very sweet..she looks so happy...every bit of her face is glowing...wonderful job with the costume. 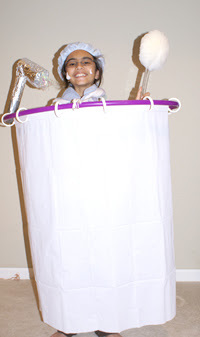 That is a great costume idea...plan to use it once S gets over the princess phase. How cute! And very clever. Manisha, That costume rocks! Medha looks so happy with it,too. My son is a fireman today. He is happy with an axe, rope and a hard hat. The daughters gonna be, what else but a fairy. i love it!!! she seems to have enjoying it thoroughly. What a fun costume! She looks so excited (naturally, with such a cute costume, who wouldn't be)! Happy Halloween to you and Medha! very cool! Cant wait for my kids to get big enough to think more creatively! Love the costume! Happy Halloween to u guys Manisha! Aww.. she looks adorable and oh so happy. Great idea Manisha and very well executed. Thank you all very much for sharing in our fun! TC, those witches are just too cute! They are the huggable and kissable kind of witches! But just you wait! By the time they are in 4th and 5th grade, they want to make their own costumes. We had a shower theme going in the neighborhood this evening. Two of Medha's friends were a shampoo and a conditioner. The 'A' fell off the shampoo so the others had a great time calling her Sh! (m)Poo! Ashwini, she will really be tickled when I tell her what you said! Sandeepa, some lessons learned: make sure the hula hoop is small. It's difficult to get through doorways with a large hula hoop. Medha has to tip it to one side. Their school parade starts off with the first class at one end of the school and they go through each class, picking up that class as they go, until they have been through all classrooms and they reach their own again. This way, all the kids get to see everyone else's costumes. So there were a LOT of doorways to handle! And while stairs were not difficult to manage, she had to learn how to tilt the thing so that she could see and walk down without tripping. Once she got the hang of it, she was running with the rest of the kids! The shampoo and the conditioner had a tough time! Suganya, she got it from the NG Kids mag and we tried to make it with everything we had at home. Nupur, thanks for that advice! We were very close to doing that when Medha said that she would prefer to not put anything on her face cos she would feel cold. It was quite nippy. The kids who had paint on their faces were complaining by the time we were done! ISG, I am usually a costume buyer - it's so much easier. But this costume was easy, too. She didn't need to be dressed up or have her face painted or her hair done. Just plonk the thing on her shoulders, put the shower cap on and off she went! Rachna, that's a thought! I'd have to glue it to her face though or have her lick it to have it stick! Vee, a handsome fireman I am sure! Boys are so much easier than girls! Every girl must be a fairy, a princess, and a witch at least once! I made Medha wear her Spider Countess costume twice! Three years ago and last year. No-one here had seen her in that costume. Mythili, Ashu, Shilpa, Sunita, Anita, Rahin, Kitt, Asha, Richa, Sagari, Manasi, Bee, Musical, Latha and Laavanya, thank you all very much! Medha had a great day. We hope you had a good Hallowe'en, too! that is so creative!! she looks great Manisha. Medha looks so cute!...and such a wonderful costume...great job! My daughter's comment after seeing Medha's costume: "Hey, I saw that in MY national geographic magazine! I wanted to do it." Archana and Srivalli, thanks! It was fun watching people's faces today when she told them what she dressed up as! Lee, there was a much better turnout than last year. We have quite a few toddlers in the 'hood this year and it wasn't as cold and blustery as last year! I was there for the parade - it's something we never miss. There are parents who come just for the parade and don't stay for the party. The party was fun, too. They had organized it themselves and they did it so well that two Moms got orders to get a chocolate fountain! Sadly, only one was used and the other is going to be returned! They then bobbed for gummy worms. It was so much fun! RP, you should have let her do it! It was by far the most entertaining costume she has ever had. There is always next year! Only you are going to know the hiding place? Bad! Bad! Bad, RP! I have already tried a few and have spit them out. Some of the candy is just so gross! The only ones that have found favor with me so far are the sour Skittles, Kit Kat and Butterfinger. Butterfinger makes me feel sick as it is so sweet but I have to eat it no matter what! 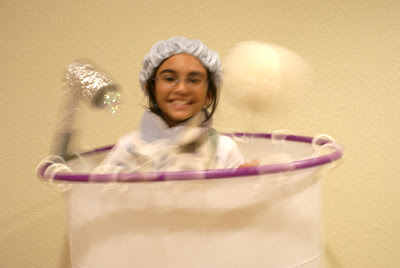 Medha looks like scientist in the shower ;). How come I missed this post! Thats some fun you guys had. 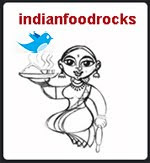 Anjali, I am still on the old Blogger template so I don't have the link to Older Post at the bottom of each post. Instead you have to use "IFR Posts in the Past" to go back in time. Also, with this daily posting challenge, older posts tend to 'disappear' quicker. Try setting up an account on Bloglines to monitor blogs that you read. You can save posts as new in the reader so it becomes a neat bookmarking tool, too! It has worked very well for me for the last 3-4 years at least! I have so many feeds that I need to spend time pruning my list now! Or try Google Reader.